Why buy a product that’s going to fail inside of a Year or two when our product lasts a lifetime? Call now for further information and to order. InnerSeal CBE is an advanced blend of technology that offers the absolute ultimate in protection for concrete and cementious surfaces. InnerSeal CBE’s dual technology formula essentially combines the internal strengthening and protection of InnerSeal DPS with the un-matched surface sealing and waterproofing capabilities of Hydro-Top. InnerSeal CBE waterproofs, seals, hardens and protects against the elements while also creating a permanent internal barrier, stopping moisture and alkali attack from below. InnerSeal CBE can be used on most porous unsealed concrete and cementious surfaces such as concrete, block, stucco and mortar. Applications include; Driveways, Sidewalks, Bridges, Aqua ducts, Pre cast & Tilt Up Construction, Swimming Pool decks and Parking Garages. 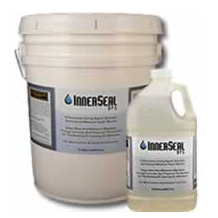 InnerSeal CBE is the ultimate clear penetrating sealer. InnerSeal CBE has a natural matte finish and will never flake, peel or chip.